Whether you pay rent or you collect it, the free Rent Pay Records is the perfect tool to help you organize it all. The free document is a simple template that allows you to enter all the payments you need to make for you rent for the coming months. This document ensures that you always have the right amount of money in your account and that you’re never late for a payment. Many landlords will charge you late fees. You also don’t want your next landlord to see you have a history of late payments. To start using the free Rent Pay Records today, just follow the simple steps below after downloading the free file below. To download, just follow the link at the bottom of this page to get started. Next, enter the information in the first section of this template. You will list the name of the tenant, the address, the landlord, and the landlord ID (if applicable). The template also gives you an example of what to fill out next. You have the number of weeks in this pay period first. When you need to enter your payments, start with the rent due date, then the rent period (to and from). 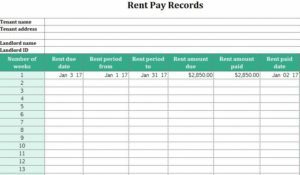 You can see how easy it will be to use this template to start organizing your monthly rent payments. Even better, if you’re a landlord with multiple tenants, you can see when the money starts rolling in. This template is a fast and free way to start getting your monthly payments organized and best of all its 100% free to use.